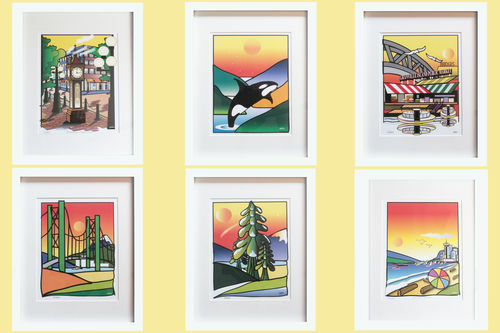 Painted Rocket Designs is the exclusive home to the original artwork of Vancouver artist Ivan Solomon. Inspired by kids, grand-kids and our natural surroundings in the Pacific NorthWest, each design is created by hand on a blank digital canvas and printed on a wide range of materials. Our wall art can be described as colourful, whimsical, sentimental and scenic, to be enjoyed by children and adults alike. We hope you enjoy our artwork, created 100% in beautiful Vancouver, BC. Weâ��re always creating so please visit us often for our latest designs and products.